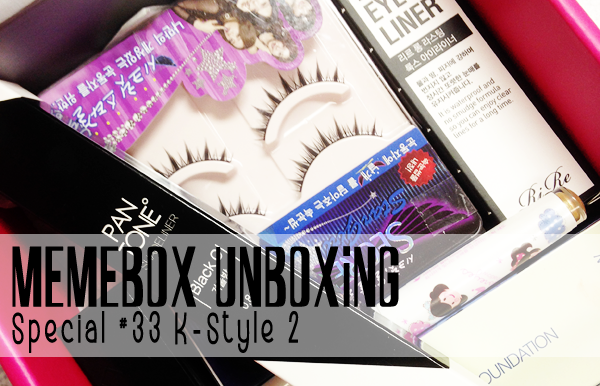 If you'll recall, I absolutely loved my first K-Style Memebox and actually said it might be my favorite of the bunch. It had a CC cream that I've been using pretty consistently since I got it as well as some great eye, lip and cheek products that I've really been enjoying. Of course, I had to go and order the second edition the very same day that the first box arrived and I've been waiting impatiently for it to arrive - and of course I had it shipped ground since the value set I wanted sold out in the time it took for me to sign into the site. So. How do I feel about it? Well. Disappointed, if we're being honest (and we always are.) Yup, distinctly disappointed. So let's keep reading and take a look at the inner workings of this box. "You know when you catch yourself with your eyes glued to the screen wondering what the hell K-celebs put on their face to look so jaw-droppingly gorgeous? 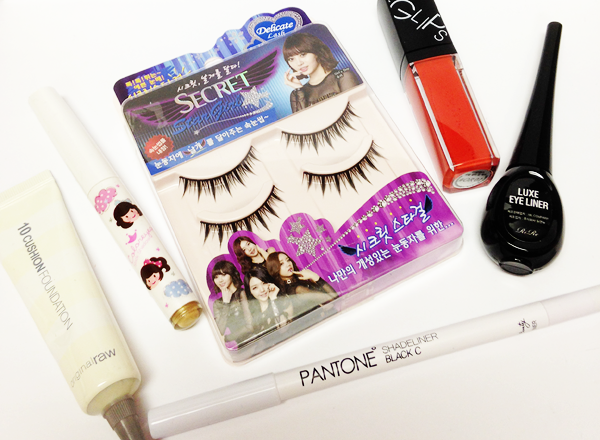 Find out the K-Style secret with our K-Style 2 Box! Korean makeup is all about radiant feminine beauty, and with this box, you’ll be able to recreate all of your favorite K-celeb’s beauty looks! Whether you want to take the spotlight with a fun and dramatic K-pop eye and lip combo, or want to perfect understated elegance with bright and flawless skin, and signature K-drama celeb lips, the final results will be some kind of gorgeous. Upgrade your beauty collection with this box, and your makeup pouch will be the envy of every Seoulite!" "An auto-type and easily-gliding like a gel liner, Royal Nature's Pantone Shadeliner series comes in 4 unique shades. It includes sharpening, full dries within 5 seconds of application, and boosts a long-lasting, waterproof, and oil-proof finish." I think this might be the only time in my life that I ever say this... but I would have so much preferred the pink one. This is fine and I really shouldn't complain, but there was the option of this really beautiful, bright fuscia shade and I feel like that would have been the one that is unlike anything that I have and it would have excited me. I don't get excited about black liner anymore... particularly since I rarely actually wear black pencil liner. So. Yeah, it's fine and I'll throw it into rotation, but it's not the pink one. Whining? Why yes, I am. First off.. there is a description on the card underneath this product... but it is certainly not the description for the lashes. In fact, I'm pretty sure it's for some kind of blush, which makes me wonder if these are a substitution. Kinda wish it had been the blush. Also, I'm going to make my own description. "These crazyass lashes are super spiky for the purpose of killing bugs that deign to get too close to the princess popstar's eyes. The band is as thick as possible to ensure the highest level of discomfort for the person wearing them. They don't 100% resemble creepy doll lashes, though, and that's probably as good as you're going to get." ~Me. In all seriousness, though, these are kinda perfect for my planned Halloween makeup/costume so I'm kinda glad I got them. They're too bonkers for every day by anyone whose status as an adult prohibits looking like a crazy popstar, but they're pretty perfect for a costume. Of course, this means I won't get to put the lashes I got in my 10 Minute Box to use... Unless I go really wild, do double crazy lashes, and risk losing my vision. We'll see... Or maybe I won't see! 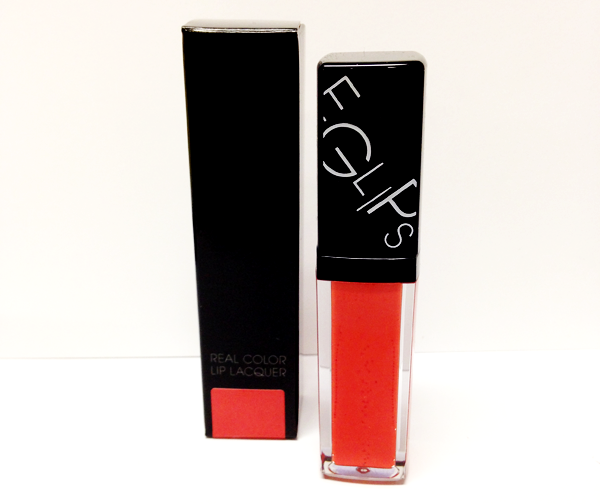 "Eglips' Real Color Lip Lacquer is basically a lip gloss, a lipstick, and a lip tiny all combined together for the better! The trendy, vibrant colors leave your lips moist, glossy, and radiant for all day long." My kingdom for some kind of button on the Memebox website that keeps them from sending me orange lip products every five minutes. I was actually hopeful when I saw the little sticker on the outside of the box because it appeared to be more of a poppy red than a straight up orange... but then I opened the packaging and pulled out the doe foot to find that this is straight up, 100% tangerine orange. And it kinda smells funky... But I would be able to ignore the smell if I had received the fierce looking purple shade that I see in the picture. Sigh. Orange lips. No. 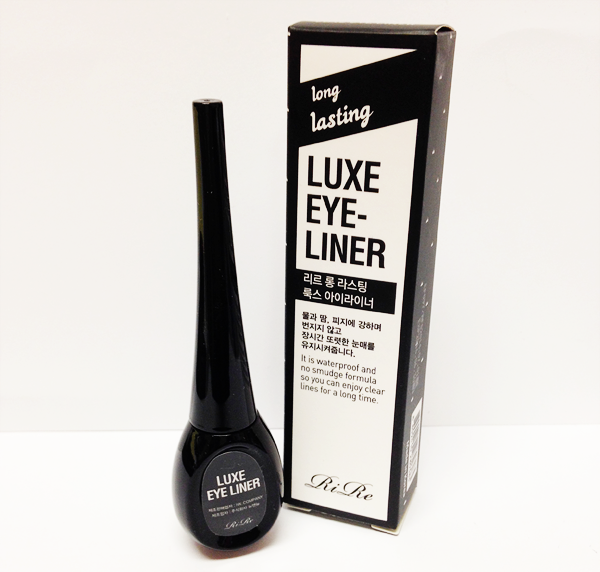 "This unique black eyeliner comes with a tiny mirror attached to its bottle, making it easier for your to retouch your lines whenever and wherever you are! Plus, it's very strong against water, oil, and sweat, it washes off easily with just warm water and a little bit of swipe, and its thin brush delicately fills in between the lashes for a deep, well-defined look." Okay, first off... The grammar is killing me. I swear, it's killing me. I know that there's issues with translation, but I would be a lot more forgiving is this company didn't appear to have a US HQ in Los Angeles where there are staff who presumably speak English. Just me? Anyway, I'm excited about this product and I feel like it's the clear winner of the box for me. It's BLACK. Like really, really black. Based on the swatch I did, it sets like a beast and doesn't want to go anywhere once it's settled. Also, it has a very fine brush tip, which is my preferred method of liquid liner application. And did I mention that it's black as hell? It's black as hell. And smooth. And kinda gorgeous. I really can't wait to apply it to my eyes and see how it looks. This one is a win. "We've picked out the best two shadows from Shara Shara's lovely eyeshadows that easily glide onto the skin and leaves a silky smooth finish. The romantic shadow is creamy in texture and comes in an auto stick-type, make it an easy-to-apply must-have for even makeup beginners." This came in two shades, a pink and a gold, and I received the gold shade. Now, granted, I don't wear a lot of gold on my eyes because I can never seem to get it to look like anything but a crazy disco shimmer mess, this is actually really pretty and I'm looking forward to trying it on my eyes. It's a really pale, champagne like gold with some glitter in it that somehow manages to look kind of subtle. It's not too pigmented, so it'll be easy to get a nice wash of colour to just give the eyes a little pop and life. I think this could actually end up being a really good product for me, so I can't wait to try it. 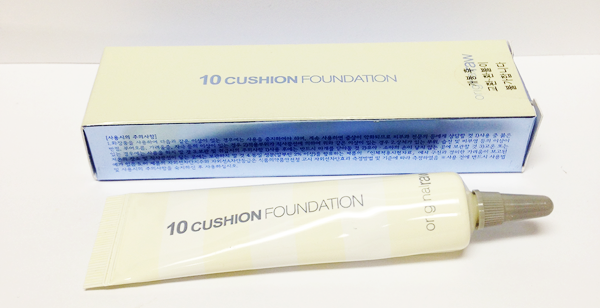 "This Ten Cushion Foundation is a makeup base, CC cream, moisturizing essence, moisturizing pact, and a sunblock all in one smart item! With just a single application, it'll soothe, brighten up, smooth out, moisturize, and cover up skin imperfections. Experience a truly glowing complexion that actually lasts all day long." Anyone else notice that there's no cushion here? There's no cushion. What this actually is is a tiny little tube of tinted cream. Now, I had to consult The Internet on this product because it seemed out of this world that this sample size looking tube was called a "Cushion Foundation" and valued at $32 for 13g of product. I did actually manage to find it, which is a nice chance for the products that make me side eye in my Memeboxes, and the size and price are actually technically correct. Technically. However, all of the version of this product that I found online actually did come in a compact with a cushion. A nice compact, actually. So... Yeah, technically this product is $32 for 13g... but in actuality, it's $32 for 13g of this product in a really nice compact with the applicator that was intended for it. I'm not happy with this. I mean... Seriously, Memebox? Is this a refill? What the hell? So. It actually might be unfortunate that the foundation was the last thing on the card (I presented them in this post in the order that they were presented on the card) because that foundation pisses me off and that's where I'm left for my overall impression. There's 2 products that I'm looking forward to trying, some lashes that will be part of my Halloween costume, an orange lipstick that will inevitably end up in the trash at some point, a black liner to go with all my other black liners I don't use, and half a cushion foundation. Yeah. No. Shame, Memebox. Shame. The first K-Style box was one of the best boxes that I've gotten, and this one was by far the worst. By. Far. I'm not disappointed that I didn't order K-Style 3 or 4 at this point. Bad taste in my mouth. That said, I've had good luck with Memebox in the past and I hope I have good luck in the future. I still recommend trying them... A lot of the boxes I've gotten have been real winners.